We need to train or code our mind to say NO to many thoughts/ Ideas in order to keep progressing on one particular idea or your goal and remain focus on your goal. We get ideas for new features to be added to our product or new product development, on top of it, we also get dozens of good ideas from our customers too. But if we keep chasing on these wonderful ideas, we shall not reach anywhere. (It’s like a treadmill wherein you never get anywhere.). 02 Sep How to say “No” in order to keep focus in your business? Do you know as to how many thoughts does a human being gets on an average in a day? The answer is approx. 50,000 to 70,000 thoughts i.e. 35-50 thoughts per minute. Some thoughts are negative in nature and few positive ones convert into Ideas. So how do we keep focus? The complexity grows when you are running or about to begin your startup company. The foremost thing that you need in any business or profession is FOCUS. We need to train or code our mind to say NO to many thoughts/ ideas in order to keep progressing on one particular idea or goal and remain focused on our goal. We get ideas for new features to be added to our product or new product development, on top of it, we also get dozens of good ideas from our customers too. But if we keep chasing on these wonderful ideas, we shall not reach anywhere. (It’s like a treadmill wherein you never get anywhere.). So what do business owners do in such cases? Don’t get excited in the heat of the moment with a great idea, instead, write it down and park it for a couple of weeks and revisit them with a calm mind and see if it really make sense to add this idea in your current product in order to add value to its customers. How much additional resource would new idea take in order to execute? Analyze the cost-benefit aspect and then decide. You as an entrepreneur or business owner has to believe in your business model more than anyone else. You need to have a faith in whatever you are doing. If you don’t believe yourself, no one else would. 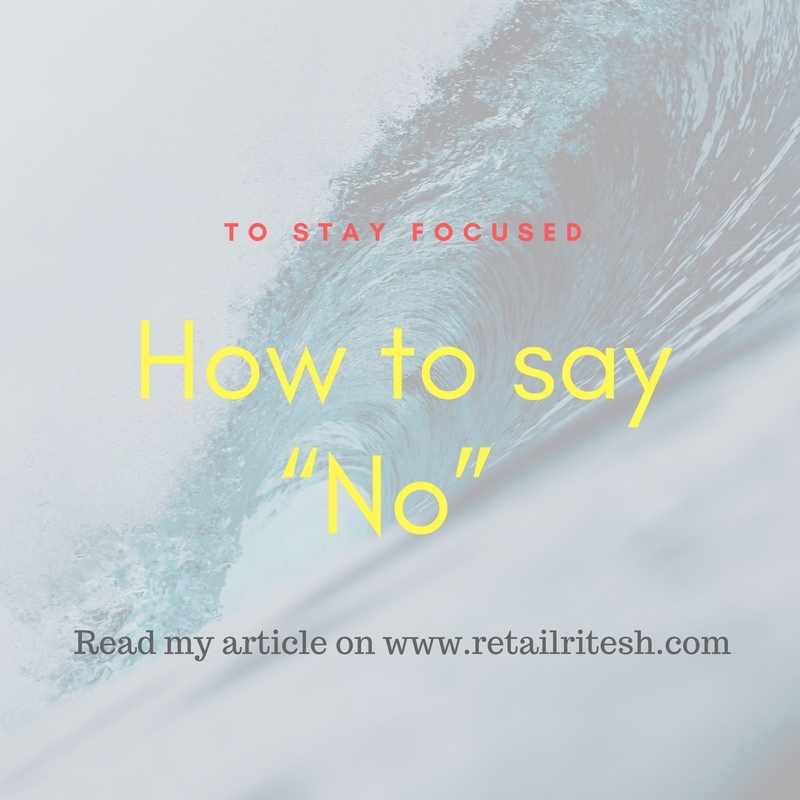 Learn to say “No” is a truly a quality that we need to learn in order to stay focused towards our goals. ING Direct has built the fastest growing bank in the US by adopting to this principle of saying NO. When their customer asks for credit card, their answer is No; when they ask for an online brokerage account, their answer is again No. ING direct wants to keep things simple. That’s why the bank offers just a few saving accounts, certificates of deposit, mutual funds and that’s it. Going with limited product features or offerings will help you to scale up your business without adding any cost overheads. I hope my article would help my readers to focus more on their projects, businesses, and career. You know who your “Go To person” is in case you need any advice or help pertaining to your business or startup. References: Book Rework by Jason Fried & David Heinemeier Hansson. Ritesh Mohan is a passionate Retail professional with over 20 years in the Retail sector, handling some of the biggest brands in beauty, fashion, and fragrances Retail & FMCG sector. He has been instrumental in the growth of some of the regional brands as well in the Middle East region. He specializes in Retail management, Product development and Brand management, Retail Operations, Sales Management and Franchising & Business Management. He strongly believes in empowering business owners with his wisdom & experience of around two decades in the industry. thanks, Shirin. I am glad you liked it.